Oceanographer Paola Rizzoli has led a crusade to save the beloved Italian city where she grew up, Venice, via advanced science and engineering efforts. The northern Italian port on the Adriatic Sea is actually a series of 117 islands, unwisely constructed on a 207-square-mile lagoon, and has been prone to flooding for centuries. Rizzoli specializes in ocean currents, and has contributed reams of data to support one controversial plan to keep Venice dry by the deployment of immense underwater gates. Rizzoli has been researching Venice's problems for much of her academic career. She was born in Lonigo, a town in the province of Vicenza near Venice, and moved to the fabled city as a teenager in 1959. The area was first settled in the sixth century, and prospered immensely from its position as a trading post between East and West after the ninth century. Its riches helped build a city of stunning architectural gems during the medieval, Renaissance, and Baroque periods, which can still be viewed in the twenty-first century from the boats that serve as the city's primary method of transportation. But in modern times, Venice has been sinking precipitously due to a combination of environmental problems, both local and global. Industrialization of the Adriatic coast has contributed to the problem, as has global warming, and the city has sunk nine inches during the twentieth century; previously, it sank at the rate of one inch every 100 years. City officials regularly post warnings of acqua alta, or "high water," with increasing frequency, which makes Venice a dismal, soggy place to traverse. Rizzoli was at the forefront of the issue from the start. After graduating from the University of Padua with a Ph.D. in theoretical physics in 1968, she took a post-doctoral fellowship in Venice at the Istituto Dinamica Grandi Masse, a research institute established by the Italian government after the 1966 floods. Part of her work involved gathering data about sea tides as the chief scientist aboard research vessels that plied the Adriatic. She began constructing models of the sea to research how Adriatic tides affected the city. During the 1970s, she commuted between Venice and San Diego, where she earned another Ph.D. from the University of California's Scripps Institution of Oceanography in 1978. Her thesis topic investigated hurricanes and their oceanic counterparts, the cold/warm circular ring structures whose flows affect tides. 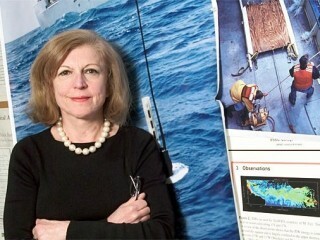 Her work drew upon previous research done by Massachusetts Institute of Technology (MIT) scientist Edward Lorenz, and in 1981 Lorenz invited her to join the MIT faculty as an assistant professor of oceanography. That same year, Rizzoli and two MIT colleagues completed an impact study that favored a proposed $5 billion engineering project to install a system of dozens of floodgates on the Adriatic seafloor. Nicknamed "MOSE," or the Modulo Sperimentale Elettromeccanico-with a nod to the biblical prophet, Moses, who parted the Red Sea-the gates would be stationed at Venice's three major inlets, the Lido, Malamocco, and Chioggia. Concrete and metal anchors weighing 300 tons each would hold down gates that were 65 feet wide; at the flick of a control-center switch, they could be filled with compressed air, which would force water to act as a barrier for threatening tides. The start of the MOSE project was delayed for several more years due to disagreements about its potential effectiveness and possible environmental impact on the city and its canals. Scientists in the opposing camp warned that if sea levels continued to rise because of global warming, the gates might be useless in the end. Rizzoli's studies assert that at most the gates would have to be deployed a half-dozen times a year; conflicting viewpoints warn that the figure might be ten times that, which would could cause the Venetian lagoon to become stagnant. "I have become very cynical. I am afraid this project will not be completed," she told McHugh in the Wired article. "Not in my lifetime." Some type of system to remedy Venice's acqua alta was long overdue since that terrible day in 1966, she maintained. "London flooded in the 1970s, and they built the Thames River barriers five years later," she told McHugh. She noted that the early nineteenth-century English Romantic poet Lord Byron had once describe Venetians as so garrulous that they talked in their sleep. She noted that such a characteristic had hampered a practical solution to the flooding problem. "In Venice, we had our flood in 1966, and we are still talking."